0:37 | A committee responsible for an exhibition on the life and work of the late King Bhumibol Adulyadej has announced that the exhibition and the Royal Crematorium will be open to the public from November 1-30, 2017 to provide everyone with an opportunity to admire the beauty of the royal crematorium and related structures. 1:35 | Minister of Interior, General Anupong Paochinda, on Wednesday acknowledged the progress attained so far in preparation for the royal cremation in regional provinces. Eight hundred and seventy eight booths will be constructed in various places where people can place funeral wood flowers. Meanwhile the Community Development Department (CDD) said that so far 376 of 878 bouquets of funeral wood flowers have been made by provincial and district administrations and more than 19.4 million flower have been made by the general public. By September 20 more than 36.8 million flowers are expected to have been made. 3:08 | The Queen Sirikit Park Foundation has announced that it will be hosting the 11th Flora Fair at Queen Sirikit Park in Bangkok to celebrate the Queen dowager Sirikit’s 85th birthday anniversary on August 12th, and to acknowledge her contribution to biodiversity protection in the kingdom. 4:23 | Prime Minister General Prayut Chan-o-cha has chaired a meeting with the education reform committee and instructed it to prioritize crucial structural issues and critical matters, adding that reform measures must be practical and take into consideration input from all sides. He also instructed the committee to manage its budget using IT systems to ensure efficiency and transparency. 5:26 | Constitution Drafting Committee (CDC) chairman, Meechai Ruchupan, has expressed confidence that the draft law on criminal procedure for political office holders is on par with international practices. Mr Ruchupan confirmed that the charter drafters had received the draft law back following its endorsement by the National Legislative Assembly (NLA). The CDC will now review the draft law to ensure it is not in contradiction with the Constitution. 6:32 | Another public forum to hear opinions related to the national reconciliation social contract has been held by the Royal Thai Army (RTA) in Thailand’s north. The first draft of the contract was completed after the committee in charge held numerous forums to collect opinions and suggestions from people across the country. The final consultation meeting was to be held in Southern Thailand today. The public will be informed of the social contract’s contents at a later date. 10:01 | According to Department of Foreign Trade (DFT) director-general, Duangporn Rodphaya, the private sector has purchased almost all of the last 160,000 tons of rice for consumption in the government stockpile, leaving just 100 tons. Eleven bids worth a combined Bt1.13 billion (US$33.601 million) were submitted. A further 270,000 tons of rice fit for industrial use only remains in store due to a legal challenge. 11:21 | Minister of Energy, General Anantaporn Kanjanarat, has presided over the signing of a memorandum of understanding (MoU) committing to efficiency and transparency between government units and private organisations involved in two new multi-billion baht projects. 12:55 | Chairman of the Federation of Thai Industries (FTI), Chen Namchaisiri, has reported that the Industrial Entrepreneurs Index (IEI) for June 2017 had dropped from 85.5 in May to 84.7, largely due to a shortage of workers following the announcement of the Royal Decree on foreign workers and lower purchasing power in the country. Despite this the IEI for the next three months had increased from 99.6 to 100.7. 14:21 | Kasikorn Bank (KBank) has organized a seminar to educate people on how blockchain technology can enhance financial transactions by broadcasting updates to everyone in the network, while verifying amendments to the blockchain through a crowd source mechanism, thereby making it highly secure. 15:15 | The King Prajadhipok Museum in Bangkok is organising an exhibition titled ‘From Palace Kitchens to Today’s Eateries’ to showcase the history of Thai food emanating from the culture of palace dishes, traditionally prepared for both taste and visual appeal. It wasn’t until 1932 when some of the cook staff in the royal kitchens quit their positions and started their own businesses that palace food became known to the public. 17:18 | A meeting between Thailand Minister of Labour, General Sirichai Distakul, and Cambodian Labor Department Director-General, Seng Sakda, has resolved to work together to tackle the problem of improperly documented foreign workers in Thailand. 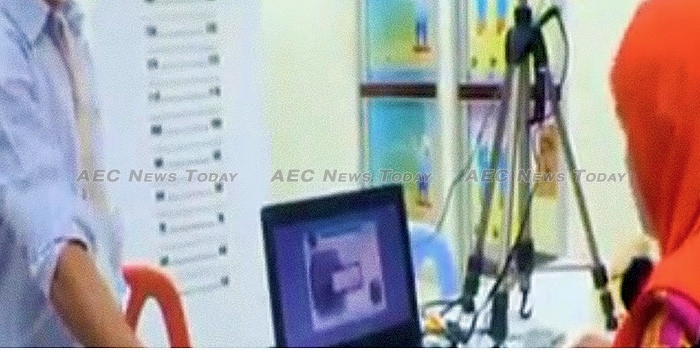 Cambodia will establish a one-stop service center for nationality verification next month in Rayong and in Songkhla Province for Cambodian nationals who hold a ‘pink card’, but whose nationality remains unverified, particularly those working as fishermen. Thailand will commence opening foreign workers’ coordination centers nationwide commencing July 24 to help process a backlog of more than 20,000 migrant workers’ requests for the needed ‘Travel Document for Aliens’. More than 47,000 requests have been made by Cambodian workers, but to date only 27,000 of them have received the document. The recent passing of the law on foreign workers has seen the penalty for importing illegal migrant workers increased to a jail term of three to ten years and/or a fine of Bt600,000 to Bt1 million ($17,841 – $29,735) per worker. 19:07 | More than 50 Thai and Malaysian performers and musicians have rehearsed for a concert to be held in Kuala Lumpur tonight titled ‘Thailand-Malaysia @60: A concert of Harmony’, aimed at strengthening the relationship between the two countries. 20:10 | Thailand Convention & Exhibition Bureau (Tceb) director, Jirut Itsarangkul Na Ayuthaya said the over the past ten years the Thailand Mice industry has generated over Bt150 billion ($4.46 billion) in revenue and created 160,000 jobs. He said that Tceb has implemented policies to further develop Thailand’s Mice industry by supporting existing industries and expanding into new markets in accordance with the Thailand 4.0 and special economic zone policies.